So, I don't know about you folks, but I have seen SEVERAL pictures on pinterest of painted furniture, and I wanted to see if I really could do it myself. I love color, so I thought having a painted head board would supply just the right touch to my new bedroom. I managed to find this metal headboard from a local thrift store. I got it for $20 (what deal!) and knew that it would be perfect for this project. It was super dingy and I didn't like the weird floral print on the knobs and the hearts. But I saw the potential and decided to go for it anyway. These are the tricks of the trade my friends. The first thing I did was remove all the gross sticky stuff that was on the frame with Goo Gone (which is such a miracle). Then I sanded the entire bed with 120 milled sand paper. I didn't try to sand off the paint, you want to just grind a fine dusting off to prepare the surface for the paint. Then I just taped up the areas I didn't want to paint like the screws and other hardware. 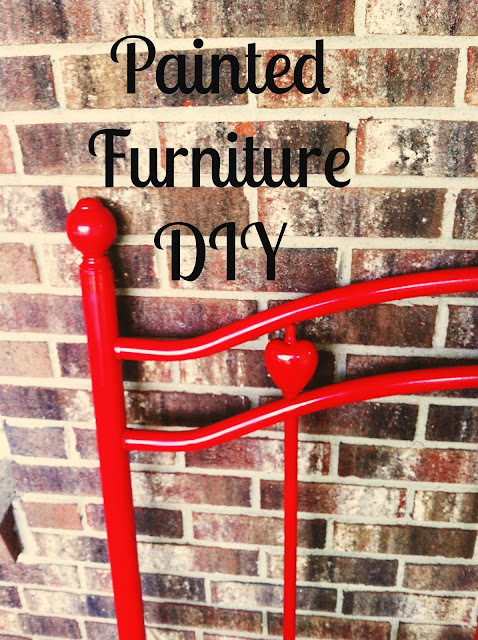 The paint I used was Rust-Oleum spray paint in apple red. It should be really durable and adhere to the surface. I just evenly spray painted the entire thing in my back yard and let it dry for a day. I only did one coat with just a few touch ups instead of an entire two coats of paint. And voila! A painted headboard! I'm pretty proud of this little DIY! It was super easy and has my mind trying to come up with more furniture I can paint haha. Hope you all enjoyed this little DIY!